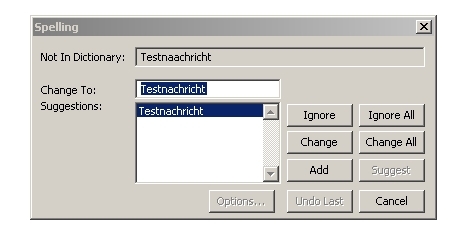 With me in OE everything is in German, but the context menu is in English! Can I change this? Context menu is "Right click menu"
That's because most likely you had set english version on first setup. Email folders are bing created only once (on first installation) on the language you had selected. To change the language you must delete email folders (DBX Files) so they will be re-created in current language. Warning: All emails will be lost in case of deletion. or you can simply access tray icon settings menu and click "Open mail folder path"
OE must be closed when deleting dbx files. yes, I mean the right-click! 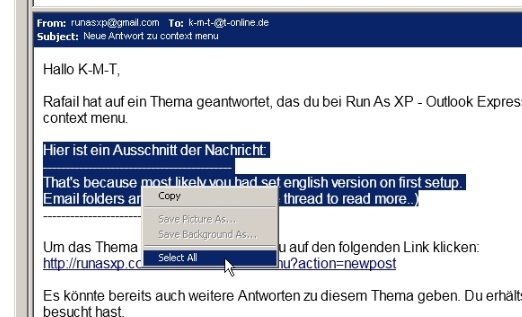 only the context menu (right click) is all in English! The spelling checker (now works with me )is the menu or the Window menu in English! Via the tray icon settings menu it does not work! Well, That's the Windows context menu. that menu is in your windows language and it has not to do with OE. How can I change that? But this is only in Outlook Express ... anywhere else!